We have been learning about the human body for elementary grades using curriculum from Apologia as part of the Homeschool Review Crew. As always, opinions are own. Affiliate links are present in the post which may result in a commission if you purchase through them. When the kids are younger, they tend to be naturally curious about the world around them. They want to learn more about how things work. One of the areas of science that is extremely interesting to kids is learning about the human body. After all, what is more exciting that seeing how YOU are made and the systems inside you work? 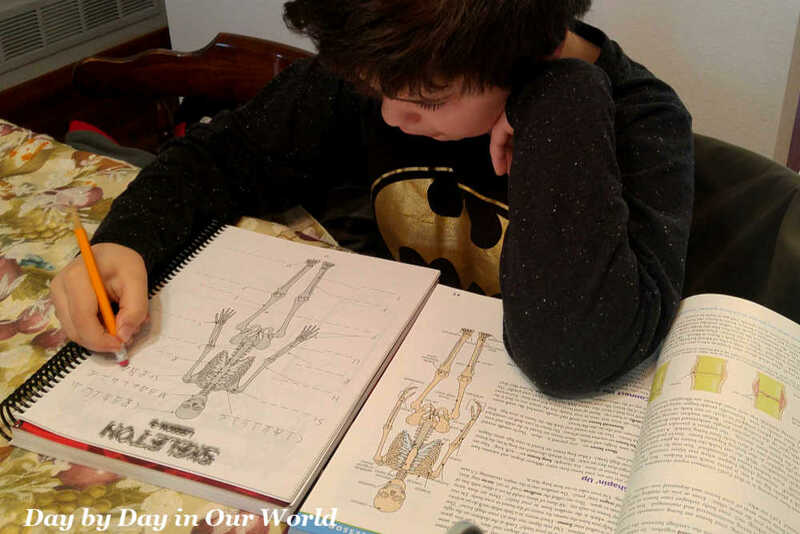 When it comes to learning about the human body for elementary grades, Apologia’s Exploring Creation with Human Anatomy and Physiology is a one-stop program. 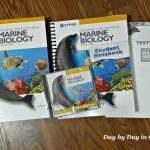 Everything you need can be done using the text and notebooking journal for your student’s academic level. This program is intended for elementary grades. But having looked through the book, I would be comfortable using this into middle school. This is also a wonderful program to do as a family with each student working at their own level. The only piece that is essential to the program is the text. This book is written in a conversational style for the student to read independently or alongside a parent. Beginning with an introductory chapter, students then go through each of the major body systems working from the inside (bones) out. The text is broken up with photos and diagrams that illustrate what is being taught. Narrative Questions break up the lessons and check that the student is retaining key information from their reading. Try This! sections encourage digging deeper into the material. Finally, Experiments or Projects at the end of each lesson allow for the hands-on application of the material. In the introduction, you will find a password to access Book Extras on the Apologia website. They now have you set up a Book Extras account so that you only need to enter the individual course passwords one time. Here you will find links to sites that help you expand your child’s studies on the topics presented. This is a great way to flesh out the course if you opt to use it during middle school. 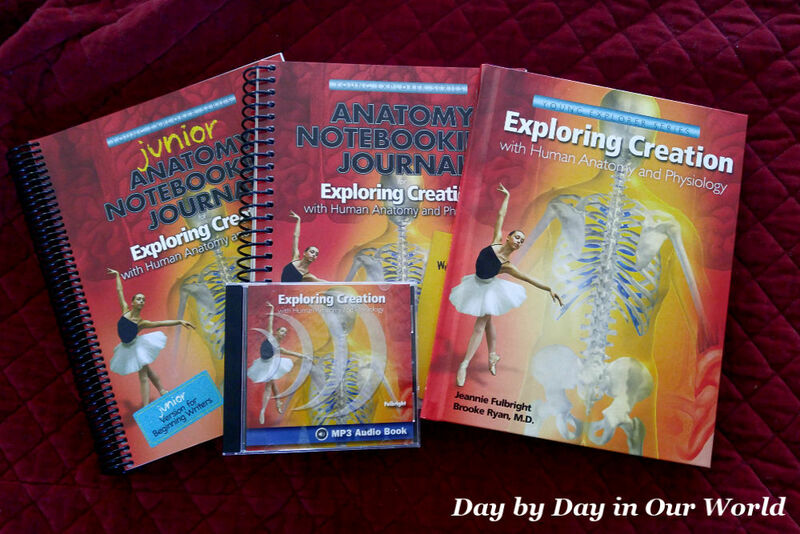 While you can use just the text to learn about the human body, the addition of complementary notebooking journals helps guide you through the material. There are 2 different levels available. The Notebooking Journal is meant for grades 3/4 and older while the Junior Notebooking Journal is meant for grades K to 2nd/3rd. Inside each of the notebooking journals, you will find activities, e.g. coloring pages in the junior edition, which are supplemental to the core learning. There are also pages to record information learned on each of the topics. Additionally, parents will find a suggested course of study for the program. This includes which pages to read from the text and those to complete in the notebooking journal. With four to seven assignments per lesson at a pace of 2 lessons per week, students are able to complete the program in one year. Sometimes the content is similar between the 2 levels as shown in the photo above. However, the different comes in how complex the material is. For the skeletal system, those working in the junior notebook have clues for what they need to label. 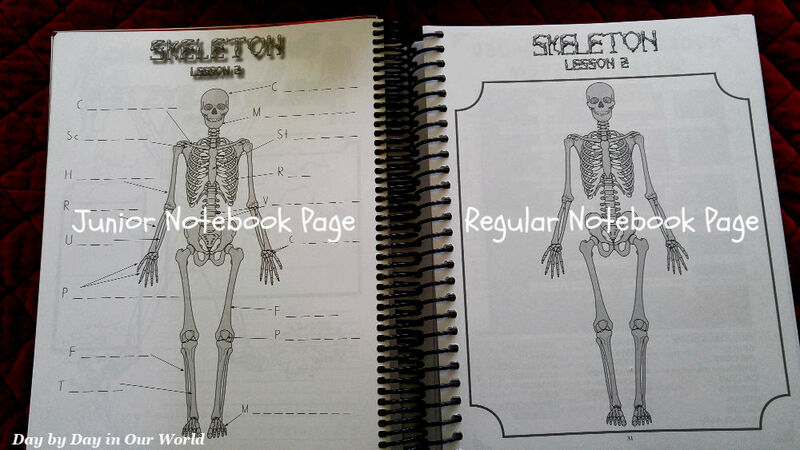 The regular notebook just has the skeletal system drawn. Where the Junior Notebooking Journal includes coloring pages with Scripture verses for each lesson, the regular one has things like crossword puzzles. Additionally, older students are expected to do more journaling without prompts than the younger students. Finally, both of the journals offer all the components needed to complete a Personal Person Project. This has the student layering the different systems/organs as they study them. The MP3 Audio CD is the final component available from Apologia. It contains professional recordings of each section in the text. If you are using a computer to play the CD, you can more easily select exactly the section needed. This can be a great way for the entire family to hear the text or allow for a beginning reader to follow along in the book while hearing the material read aloud. Seriously, my son and I are both in love with this program. I’ve used others in the past which we enjoyed. But, there is something extra special about learning all about what a marvelous creation we are. Humans truly are amazing and the more you dig the more you can see God’s handiwork. For the review, we did our best to stay on the 2 lessons per week schedule. However, life has a way of usurping our best-laid plans, so it has been at a slightly slower pace the last few weeks. Things my son liked include reading the text alongside me. We often do this snuggled together on the couch which makes science time also ‘mom time’ for him. He also has enjoyed the different hands-on learning activities we have done. Some of the Try-Its are super easy but really drill home the point being made. He was super excited to show his dad how hitting a pillow on the counter cushions the blow just like cartilage helps cushion your bones. What he is less fond of is writing in the Notebooking Journal. I know from going through this stage with his older brothers that it is more about the physical act of writing than having the knowledge needed to complete the work. So, we have more empty pages than full ones. Working on a labeling a skeleton in the Junior Notebooking Journal. He is more than willing to do the ‘easy’ pages, though. So things like labeling the major bones of the body are just fine by him. As I shared above, we have truly loved this program. If you want a science program that is well written and researched, you do not need to look any further. You’ll be learning about the human body for elementary grades quickly after receiving your materials. This is also a great program to do together as a family. There really is a lot of material in the program. 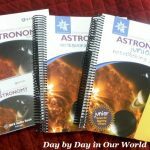 While the Junior Notebooking Journal allows for a younger elementary student to learn, even middle school students will find the material engaging and informative. Don’t just take my word for how we found this to be. 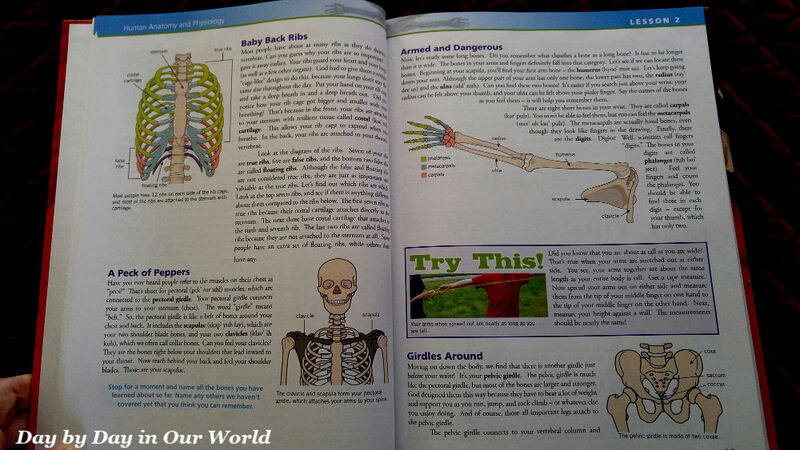 Visit Apologia – Exploring Creation with Human Anatomy and Physiology post on the Homeschool Review Crew website to see what other homeschooling parents thought about this resource.